We have now had Speckles for more than five years. That’s five years of food, treats, and toys… which adds up a lot. Yet, in all this time, I never put much thought into how the items I bought ended up in a pet store in the first place. Well, just as other merchants do, those in the pet supply industry attend tradeshows and conferences. There, retailers can learn about the newest items and hot trends. One of the largest events, SuperZoo, took place last month in Las Vegas. While I did not attend the event, I did hear about some of the highlights from Petcurean. Petcurean is a family-owned pet food company for cats and dogs. They only use healthy, quality ingredients. As a Petcurean Advocate, the company sent me a few interesting tidbits of what’s happening in the pet world. There were lots of new products this year that are sure to tempt. 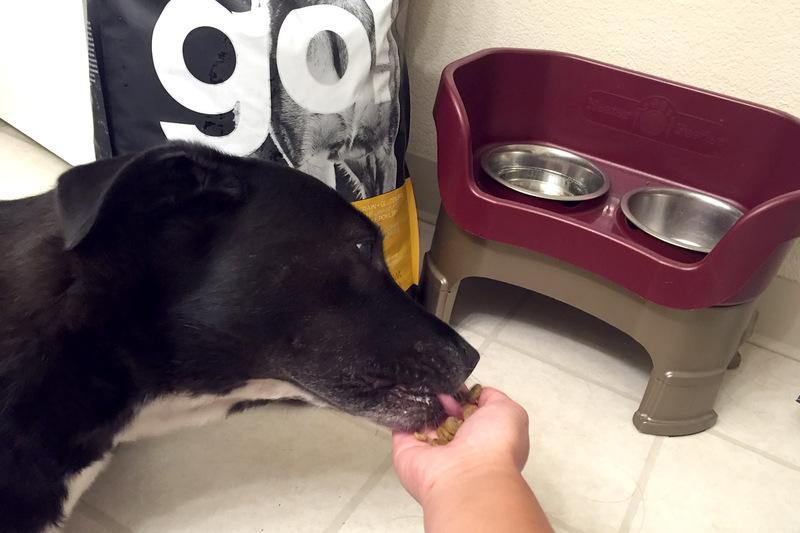 We loved the cool air cot, which provides your fur kid some air flow for hot summer days. Ball launchers were a big hit for cats and dogs alike, and if you want to make sure your pets are safe and behaving while you’re away, this doggy cam will do the trick. A halo for blind dogs took a top award from the show, marrying functional with a bit of fun. Pet care is a booming industry, and many mainstream brands are developing products to be a part of it: Burt’s Bees now offers a natural pet care line, and ECOS has developed a line of plant-derived pet cleaning products safer for pets, as well as the planet. We even saw dog waste bags from Glad! As society as a whole continues to eat heathier, and expect more sustainability and transparency in their food production, this expectation has also crossed into the pet world as well. All over the show floor, there were a lot of new products that touted everything from clean supply chain to natural ingredients. Petcurean led the pack with the introduction of GATHER, a new category of pet food crafted from certified, organic, non-GMO and sustainably produced ingredients. Including a sustainably fished and MSC certified cod recipe, a certified organic chicken recipe, and a certified vegan recipe, they are all perfectly blended and balanced to provide dogs and cats with premium quality, natural nutrition that is free from rendered ingredients. I have been compensated as part of my participation as a Petcurean Advocate. All opinions are my own. TerriAnn van Gosliga is the main writer at Cookies & Clogs. Born & raised in the SF Bay Area but loves to travel. She's been married to her best friend for 19 years, used to homeschool her 18-year-old daughter before she started a public high school/college program, and has an accident-prone lab mix dog. Hi, I'm TerriAnn — wife, mom to a teen daughter, dog-lover, Marvel fangirl, travel addict, tech nerd, car non-expert. Oh, and I have crazy good repacking skills. We won't share your email address! Free Tulips in San Francisco March 2nd During the 2019 American Tulip Day! The Nutcracker and the Four Realms Blu-ray, DVD, and Digital HD Out Now! © 2010-2017 Cookies & Clogs. All Rights Reserved.